DISCLOSURE: I am a member of the Beef Checkoff Beef Expert Bureau for which I receive an annual honorarium. 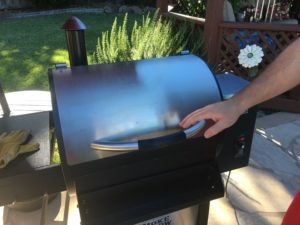 My husband and I recently got a pellet grill/smoker. We decided to christen our new outdoor kitchen tool by smoking a tri-tip roast. After the success of this first meal, we’re going to feature smoked tri-tip at our July 4th family gathering. Lean beef includes any cut that contains less than 10 grams of total fat, 4.5 grams or less of saturated fat, and less than 95 milligrams of cholesterol per 3-ounce serving. 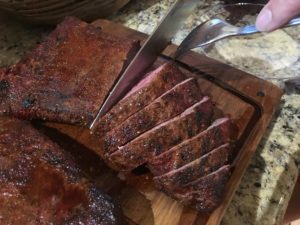 Tri-tip is a lean cut that, per 3-ounce cooked portion, contains 7.1 grams of total fat, 2.6 grams saturated fat, and 85 milligrams cholesterol. We love to use aromatic dry rubs on grilled meat. This rosemary dry rub releases the most amazing rosemary aromas when the meat is place on the smoker. The cayenne adds a bit of heat, which we love, but if your family doesn’t like that much spice, cut back to ½ teaspoon or omit it all together. Combine all ingredients in a small mixing bowl. Mix well with a spoon. *Note: I call for Diamond Crystal Kosher Salt because of its lower sodium content. This salt has a unique crystal shape. One teaspoon contains 1120 milligrams of sodium compared to 2360 milligrams in one teaspoon of a standard fine grain table salt. You can buy Diamond Crystal Kosher Salt at grocery stores nationwide. 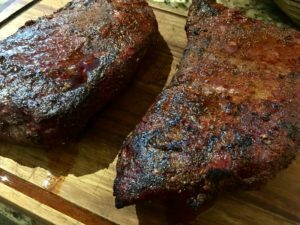 Place tri-tip roast on a baking pan. Generously rub the entire roast with the dry rub. Cover with plastic wrap and refrigerate for 4-12 hours. When you’re ready to smoke your tri-tip, place in smoker at 225-250â°F for two hours or until the internal temperature–using a meat thermometer–reaches 135°F. Remove tri-tip from smoker, place on cutting board, and allow to rest for 10 minutes. The residual cooking heat will increase the meat’s temperature to 140-145°F and allow the juices to redistribute, resulting in tender, juicy medium-rare tri-tip. Serve with your favorite side dishes. We served it with a few of our most loved side dishesâ€”corn-on-the-cob, baby red skin potatoes with dill butter, a green salad with blue cheese dressing, and watermelon.